There have been uneasy calm within the political camp of Nigeria’s ruling All Progressive Congress APC, as former Vice President of Nigeria and Presidential candidate of the Peoples Democratic Party (PDP), Atiku Abubakar successfully arrived Washington DC on a visit to the United States. The PDP presidential candidate arrived at 20.20 hours (14.20 hours Washington DC time) on Thursday, January 17, 2019. A statement by Paul Ibe, spokesperson to Atiku Abubakar, said that the PDP presidential hopeful “will in the course of his trip hold meeting with US government officials, the business community and the Nigerian community”. Atiku’s visit to the United States comes a day after he met with the business community in Lagos at an interactive session to “unveil his plans to get Nigeria working again”. 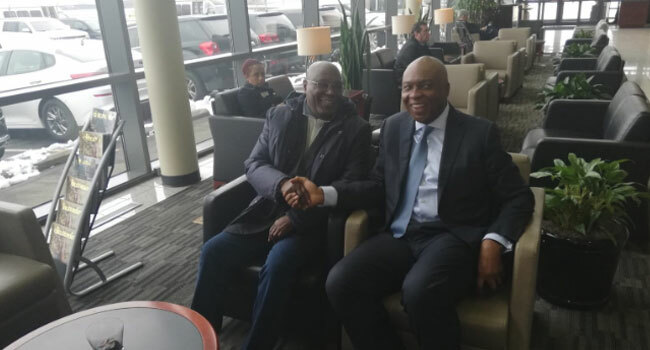 He flew out of Nigeria on Thursday morning with the DG of PDP Presidential Campaign Organisation and Senate President, Sen. Bukola Saraki for the United States. Abubakar’s arrival in the U.S. may have rattled the ruling All Progressives Congress, which has taunted him for his inability to enter the U.S. for over a decade. Mr Abubakar has not visited the U.S. since 2007 when he left as Nigeria’s vice-president. He served under former President Olusegun Obasanjo. Mr Obasanjo accused Mr Abubakar of fraud while in office, and he was also linked to corruption charges filed in the U.S. The politician denied all allegations of wrongdoing. For the over 12 years that Mr Abubakar was unable to visit the U.S. American authorities had declined to issue him entry visa and there were speculation that a secret indictment had been entered against him by that country’s authorities.